Halloween lunch straight from a salt water creek to my boiling pot of water. It doesn’t get any fresher than that. Shrimp and crab are always good! This is a treat I’ve always enjoyed and relished. I hope it was delicious 🙂 These days we have to eat this treat at a restaurant because my grandson is allergic to shellfish so we never even have it in the house. We usually don’t try to catch crabs this time of year. Friends have been catching them and our weather has been nice so we decided to give it a try. We couldn’t eat all of them so I picked the rest and put them in the freezer for winter. Oh yum! Blue fin crabs! My mouth is watering. What a treat! On our way to Florida and looking forward to blue crabs fresh from my folks crab traps! Looks so delicious! It’s so much fun to pull the traps and see what’s in them. The ones we caught Saturday were all big and full with huge claws. Do your parents catch many stone crabs? I love those, too. Enjoy your Florida crabs! 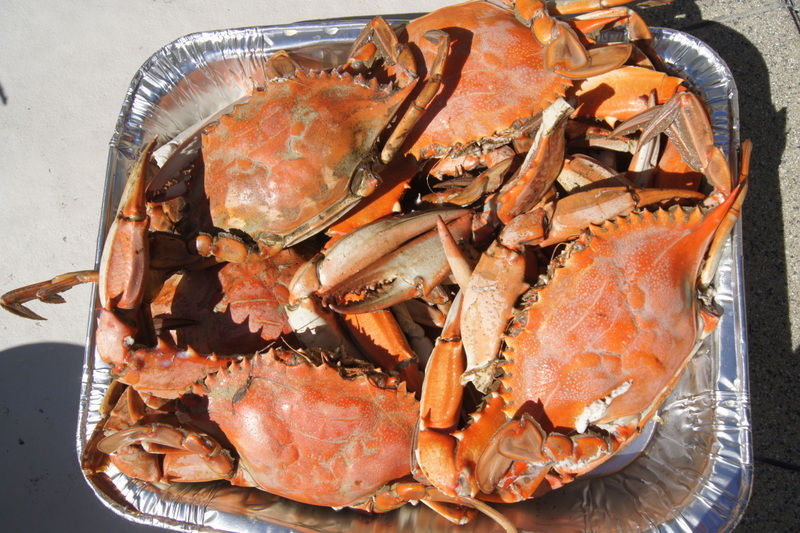 No, no stone crabs — but mountains of blue crabs from the Apalachicola Bay! Nothing better than a pile of fresh blue crabs! Makes my mouth water! Did you avoid the heavy rain that hit South Carolina last month or did it reach you too? We were fortunate not to experience the heavy rains. However, last Tuesday we experienced the highest tide I’ve ever seen in 30+ years. The combination of a full moon, spring tide and wind pushed the salt water into our yard and over roads. The road to the island was closed during the highest part of the tide. It didn’t get to our house and there was no damage. Wow. That must have been a little frightening. Happy to hear that there was no damage. Oh what a treat indeed! Yum in your tum!